I’m sitting on the cool tile floor—some relief from the hot, sticky weather just outside the door. There are upwards of 20 people in the room, but everyone is completely quiet. The only sounds are coming from the deep hum of the overhead fan and the tap, tap, tap of the bamboo stick. I’ve never perfected the art of complete stillness. This is in stark contrast to the focus of the room—the monk—who is restful, silent and focused. Everyone is there, patiently, quietly waiting for the exact same thing. Whether the motivation is artistic, cultural, spiritual—they’re all waiting to be tattooed by a Thai Buddhist monk. I’m at Wat Bang Phra, a temple 50 kilometres west of Bangkok, to get a traditional sak yant tattoo. It’s believed that this type of tattooing—yantra—has been practiced in Southeast Asia for more than 2,000 years. Monks provide sak yants to offer protection from violence and evil spirits, and to give good luck and fortune. Their devotion is unwavering: tattooing dozens of people for days, months and even years on end. 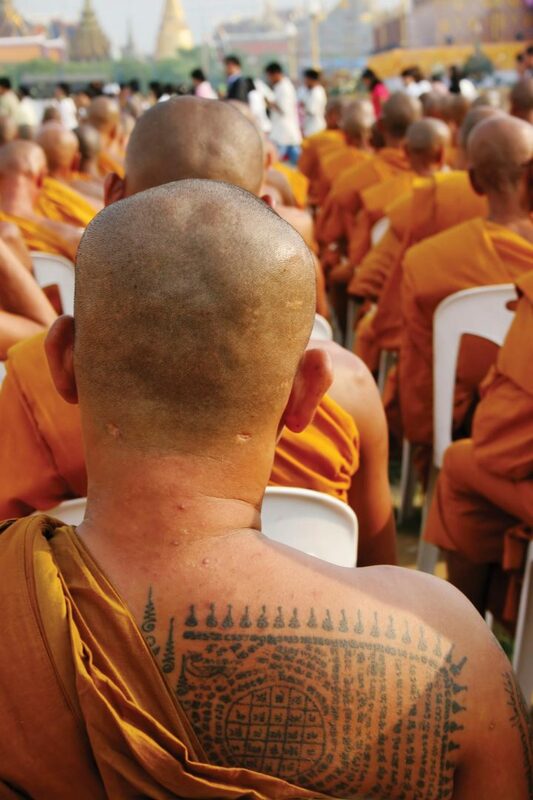 Many Thais make the pilgrimage to Wat Bang Phra—it’s world-renowned for its spiritual tattoos. The monk chooses the location and design of one’s tattoo based on their aura. The end result ranges from ancient designs to traditional prayers and sacred blessings. Different from the western tattoo machine, sak yants are applied by a bamboo stick with a metal spike on the end. The instrument is dipped in ink and tapped into the person’s skin. Each monk makes his own special blend of tattoo ink. The recipe is usually kept secret, but is believed to contain palm oil, charcoal and even snake venom. 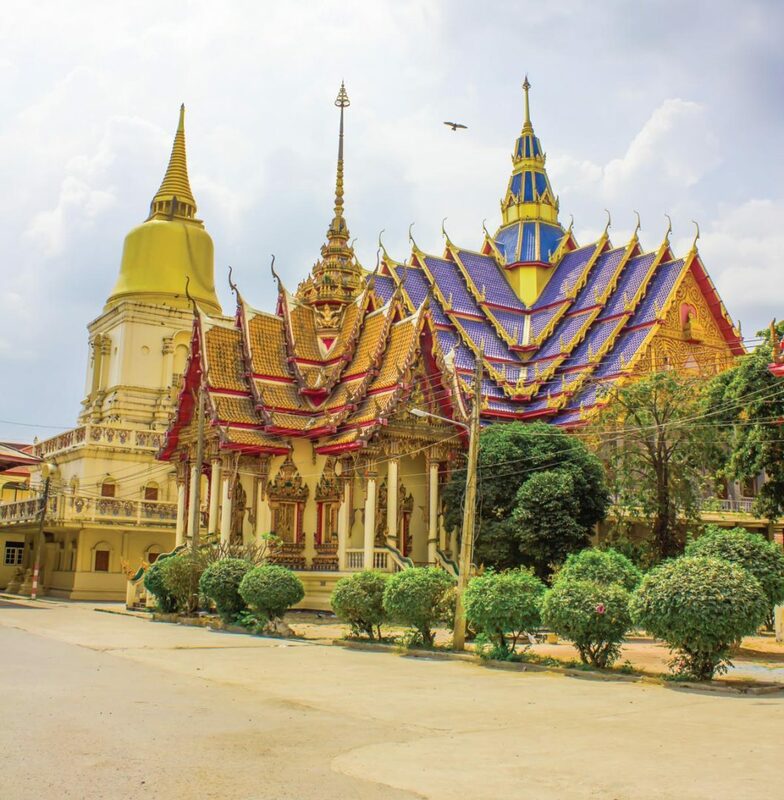 The origin of sak yants dates back thousands of years into Cambodian, Indian, Laotian and Thai history (no wonder the custom has many culturally- and religiously-mixed folklores). There are stories of messengers who would have their heads shaved and then tattooed with a secret code. They would grow out their hair to conceal the message on their head, travel to a nearby kingdom where a king would shave their hair and subsequently reveal the code. Buddhist monks also engraved sak yants on soldiers seeking protection before battle. Often, they would cover warriors’ entire bodies with tattoo designs to safeguard them from knives, arrows (and later in the history books, bullets). While the other countries have lost this cultural tradition, it still remains strong and popular in Thailand. Today, nearly 20 percent of Thais don ink from a sak yant. Our cab driver spoke no English, but I knew he realized where we wanted to go when he pulled down the back of his shirt collar and revealed his own Koa Yord (nine spire) tattoo. We arrived, and through the silent guidance of our cab driver, we bought an offering of incense, cigarettes and orchids for the temple, which is presented as a blessing (and payment) to the monk and temple for the tattoo. We walked into a room: dimly lit, with statues and photos of Buddha present, but faded from years of overlooking the place where people come to get marked. We took our spots in the queue on the floor and watched as the Thai people before us received their own sak yants. A college-aged Thai boy received a Paed Tidt (a round circle with eight points); an older woman, some scripture; others, a tiger, nine spire and more. Tattoos in Thailand are a spiritual, magical experience. The Thai monks take the art of tattooing quite seriously: they endure extensive training and have unwavering commitment to the art. Their schooling includes meditation and the union of spirit and body through Buddhist and animist teachings. Thais who come to get tattooed believe the sacred markings will stop violence and have transformative, healing effects on their lives. This steadfast devotion can be found in overdrive at the Wai Kru Sak Yant festival each March. More than 15,000 people flock to Wat Bang Phra to get (or renew) a tattoo. The hot, crowded festivities go all through the night. Many of those getting tattooed have been known to go into religious trances: moved and transformed by the magical, divine ink. Why did I come here? I’m not quite sure. Maybe it’s because this temple is giving me the opportunity, the honour, to participate in a traditional Thai custom. Maybe it’s because I want a permanent reminder of this trip, this place, this moment in time. Or maybe it’s because without the opportunity to choose the tattoo’s design or placement, it’s a moment to let go of the Western notion that we have to control everything, and trust the choice of someone else. We continue to inch forward on the floor as it gets closer and closer to our turn. Suddenly it’s the man’s turn in front of me. Along with his friend who went before him, I move forward to hold his back steady as the monk begins the tattoo. Holding the bare skin of a stranger’s back would likely be uncomfortable for me back home. But here, it gives me a sense of belonging. Actively participating in something meaningful, that this monk and this room full of Thais do year after year. Then, it’s my turn. I touch my head to the floor three times in prayer as I saw the others do before me. I lean over, my back facing the monk and wait for the bamboo stick to puncture my skin. The tattoo itself doesn’t take that long, maybe 10 minutes. I still have no idea what the design is, although I can feel the stick hitting the left side of my back. I later learn he has given me a Ha Thaew (five rows) tattoo, which prevents unjust punishment and protects against bad luck and black magic. The monk whispers a magic spell, blows on it to unleash its power. And just like that, it’s over. Jennifer Foden is a word master, world traveller and winner of the Best Cultural/Historical Feature at the 2015 Travel Media Association of Canada awards for her story in Outpost about getting tattooed in Thailand. I’m fascinated with the traditional thai tattoos! Looking forward to have one of this! Nice blog.